The 8th edition rulebook sees some of the biggest changes on the Warhammer battlefield for the best part of a decade. So here for my sanity is a quick guide of the main rules changes. Charges are now random; infantry now charge their movement rate plus 2d6”. Charges must move straight forward, but are allowed one 90 degrees turn for free. Attackers then align with the defenders. If you flee through an enemy unit or terrain you are not destroyed. Instead you take a dangerous terrain test like in 40k. You cast as before, but if your total is less than 3 you fail to cast. Bonuses do not affect this! Miscasts on a double 1 are gone. However, if you roll an irresistible force the spell is cast as in 7th ed and the caster suffers a miscast on a really nasty table! Wizards may use bound items or spells if you failed to cast a spell earlier, however, you do not add your magic level to the roll. If a model is more than 50% obscured the shooting unit suffer cover modifiers. Models can take armour and invulnerable or regeneration saves. You can not have a ward and regeneration. Bad times for Dark Elf characters and plaguebearers! This also applies in combat. Combat order is done on initiative. You no longer go first if you charge. The second rank of infantry can now fight, but with only one attack. Ranks are still counted in sets of 5. However, if you take a rank of 10 the third rank can also fight with 1 attack. Combat results are done as 7th ed except for, outnumber is gone, and your rank bonus is calculated on how many you outnumber your enemy by, up to a maximum of 3.You now receive +1 to your combat result on the turn you charge. To negate the enemies rank bonus you require at least 10 models in the flank or rear. You can now reform when defeated in combat. However, you must pass a leadership test that is modified by the amount you lost the break test by. Loads of new rules that models don’t exist for. Hmmm…. Templates no longer partial. Every model the template touches is hit. Magic resistance now adds to your ward against magic. So magic resistance 1 adds 1 to your ward save against magical spells. Terror causing creatures create fear in fear causing units. If you are charged by a terror causing unit you must pass a panic check or flee. Things such as trolls, ogres and minotaurs now count as monstrous infantry. They now fight in ranks of three and can have up to 3 supporting attacks! They also receive a stomp attack hit at their basic strength. This stomp attack always strikes last and is only for models in base to base contact with the enemy. Lots of changes due to the new special rules. Guess ranges are gone. Now you can just point and shoot! If you march through terrain you generally have to take a dangerous terrain check as on the current 40k rules. Chariots take 1d6 wounds. Units in forests do not get the steadfast rule. However, lone infantry characters and skirmishers become stubborn in forests. You may now march into buildings and charge them. You can deploy warmachines in buildings. Otherwise most the rules for building are the same as in 7th ed. To win you need to score over twice the amount of victory points your opponent has scored. Or it is a draw. Victory conditions vary on the battle. You now only score 25 points for capturing a standard. You score a 50 point bonus if you defeat an enemy character with a champion. This leaves the commander with many tough decisions. Big blocks on infantry are tough to kill. Lords are in limited by points, but not in number. Artillery are more accurate and shooting units more deadly. Monsters and ogre sized models are scary. While skirmishers/ fast cavalry are fast indeed! As I say the only way to find out what works is in the field of battle! Now some what confusingly I’m not going to be talking about the sculptors (these men and women are already so horribly talented people that don’t need me waxing lyrically about them), I am instead going to talk about the Special Characters of our favourite war games. Every one has a soft spot for one or more of the special characters weather they be the Warcasters of the Privateer Press Iron Kingdoms, one of the multitude of Games Workshop heroes or villain or one of the hundreds of other games you play. What makes them special is not the table top rules nor the abilities or bonuses you get for taking them, what I want to talk about is the personality of the characters and what makes them so loved or hated. Working at the shop I’ve met and spoken with so many new people but one thing we all have in common is our love for the worlds the games are set in, the war torn dystopian universe of Warhammer 40k to the steam powered Iron Kingdoms they are all so steeped in detail and turmoil that its hard not be drawn in to it. For now I want to talk about Warhammer 40k, it was the game that got me hooked and it also opened my eyes to the Black Library and their wonderful novels. It has also allowed me to make a lot of new friends, many of whom still play and the one thing we all have in common is the love of a particular character or faction. I’m going to use some of the regular gamers as examples to prove my point with their Warhammer 40k collections as proof. Take Mr Ant Evans (see his blog The Anarchy of Anton!) as an example, he is a sucker for a bad guy and as such plays Chaos but he doesn’t just play Chaos he lives, breaths and dreams the ruinous powers. But what makes them do appealing? His first foray into the forbidden was at the side of a Legion of Thousand Sons (much to my annoyance as I couldn’t beat them ever!) and after speaking to him about them its clear why he fell for the machinations of the weaver of fate. It was Ahriman of the Thousand Sons that had snared him, a more trajic hero there has never been a warrior mystic torn between duty and conscience he broke faith with his Primarch Magnus the Red and cast a spell to save his Legion but little did he know the consequences of his actions until after the deed was done. A man hell bent of learning of a way to restore his Legion and right the wrongs done to him he wages war only when he must and only when it will benefit him. This is the reason Ant fell in love with the Thousand Sons it was the back ground the story of tragic betrayal and the driving will of one man to put right his mistakes, the Thousand sons aren’t evil just misunderstood but what came next for Ant sealed the deal and turned his soul black for ever – but that is a story for another time. Ant chose the Thousand Sons because he loves the underdog but also has a soft spot for the bad guys, but Spencer on the other hand is a genuine good guy in every way, there isn’t much he wouldn’t do if you needed help and that is reflected in his table top choices. 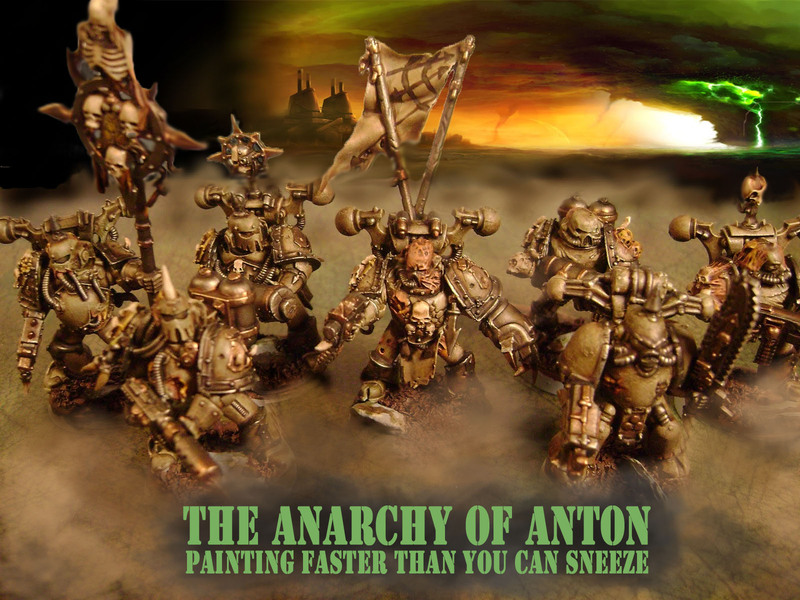 Almost the polar opposite of Ants Legion of automatons Spencer has a respectable force of Grey Knights the shinning exemplars of purity and protectors of humanity. These super human warrior enter each battle fully accepting the fact they will have to give their lives to ensure victory, they are the ultimate good guys, the heroes and the martyrs. Now I know its the hidden darkness of the Inquisition that holds Spencer in its grip but it was the fire like brightness of these pure individuals that drew him like a moth to the armies of the Holy Ordos of the Inquisition. So we have Ant who plays the ultimate bad guys because of his love of the dark side, because no one gets to have more fun than the villain and because the story grabbed him and wouldn’t let go. Spencer plays the ultimate good guys because long ago the story grabbed him and wouldn’t let go, because the good guys in the end always win over the bad guys and because something about being a 9ft tall psychic killing machine appeals to him (lets face it who wouldn’t find it appealing). And then there are players like me, I like to walk the line not committing to being a bad guy but not entirely sure I’m a good guy either some of you might have guess which colours I fly and some of you will already know that I am a Dark Angel through and through. I don’t know for sure which side I’m on (I’d like to think I know but no one can be sure) and I absolutely love the fact that I can go to war against Ants Legions of Chaos and sing the praises to the Emperor AND I can go to war against Spencer’s Grey Knight still singing from the same hymnal (all be it with a glitter of knowing in my eye). So what drew you to your army? Was it the back ground or the miniatures? If it was the miniatures what do you think about your faction’s story? Did you choose your faction or did it choose you? This weekend saw the shops hardened band of warriors (Okay so we’re not so hardened I actually saw a bunch of flowers make Kurt cry at one point) attend the UK National Warmachine and Hordes Tournament, we had hit the gym reasonable hard in the months previously and in gaming terms every one was in tip top form (Bar me having in the bottom half of our own Blood and Oil tournament early last month). We arrived in Birmingham on the Friday night and began our council of war which in all fairness was pretty much just us sat drinking beer, we had no idea what waited for us the next morning. Day one began groggily (as I was awoken by my room mate Stef’s epic snoring), we piled into two taxies and charged (as we were more than three inches away) into the Games Expo. For the majority of the Tyrants the first game was a rude awakening, we lost…I lost! Anton along with Goreshade and his merry band won their game! We celebrated and with new resolve attacked the next game, the draw came out and every one made their way to their tables to face off against the unknown. All Except me and Stef as he had drawn one another, I wont go into the detail but I lost…stop laughing! Anton won again! At this point I believe Dannie scored a win as well, we thought maybe that would be the turning point and the Tyrants would make good on their honorific. Game three, began and ended with me feeling sorry for myself as yet again I lost. I was robbed in all honesty, robbed by a very nice chap with a nice Khador force but still with only his Caster between me and my first victory…stupid Mercenary solo Rineholt and his free shot over ROF…I might ban him from the shop. It was at this juncture most of the other Tyrant’s grabbed their win, Anton lost unfortunately but with high spirits we made our way to the hotel and so began another night of serious war planning (Okay drinking but between celebrating and commiserating we had good reason), our glorious leader Dustin arrived to offer his support along with our friend Spencer. The next day began as the first did, I lost again as did several of the others and I was beginning to lose hope as I was sent with a heavy heart to the bottom table. The shock of it was enough to spur me into action, my next opponent sat down and the onslaught began. Another Khador force, Winterguard Deathstar with Scorcha and two heavies, it was starting to look like I was going to lose again until a little voice in my head said “Man up” with gritted teeth I threw Typhon into the fray and three turns and six sprays later my opponents force was broken, his caster dead and my victory secured! My last game saw me on the other end of the hall inspiring some hope that I might not get the wooden spoon, my opponent was a nice chap with a Skar led Cryxian force. It took 98mins but I managed another win, his caster died under a avalanche of Nyss longsword as my swordsmen earned their points and a place in the painting queue. The dust settled and the Tyrants had aquited themselves well, most had more victories than losses, all had had a good time and played the game with a smile and not once did I see or hear any of them act with anything less than complete decorum. So it came to the awards, safe to say none of us are Uk Masters this year but our every own Anton Evans walked away with Most Sporting! We all had a great time and we all made our mark on the tournament scene, well I say we all did…Kurt didn’t win a single game…I’ll be having his Tyrant shirt and dice back if he carries on like this.